To ship your suspension is as easy as 1-2-3! 3. Ship to address listed above. Improperly tuned or stock suspension does not allow many riders to reach their potential, limiting how fast and long they can ride. 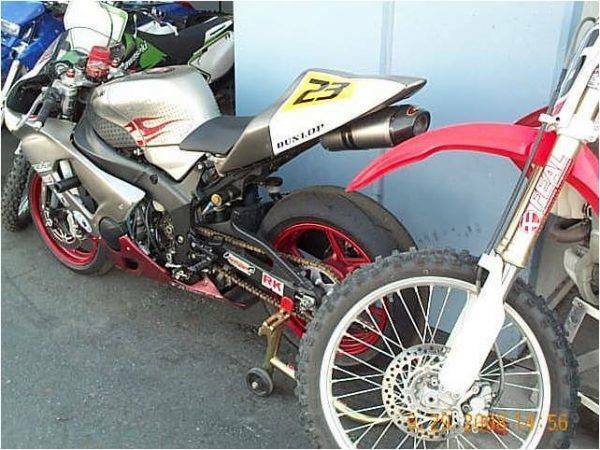 Are you having trouble keeping speed through breaking bumps, accelerating bumps, corners, or other common terrain that you ride? 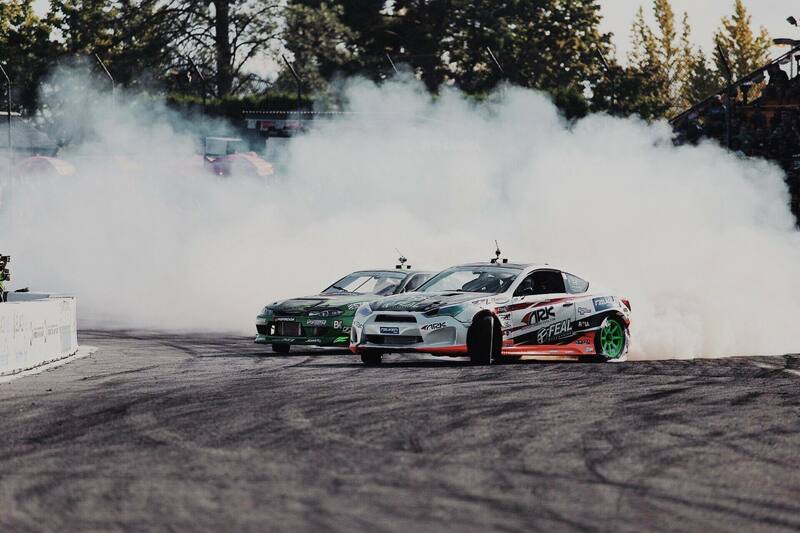 Chances are that your suspension is improperly tuned or is stock. We understand your needs and have spent countless hours testing and developing a suspension revalve service for you. Our revalve service allows riders like you to ride faster, longer, and with more confidence. 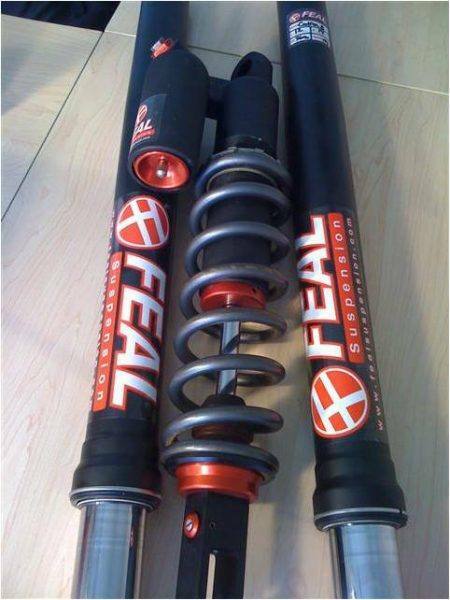 We guarantee you will be satisfied or we will revalve your suspension again at no charge within 14 days of initial purchase. Suspension fluids and wear parts break down resulting in poor suspension performance. 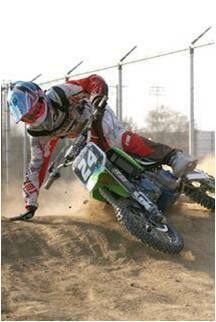 If you are a competitive racer we recommend rebuilding your suspension every 20 hours of ride time. You may not need parts replaced every time, but new fluid will yield a noticeable performance improvement. 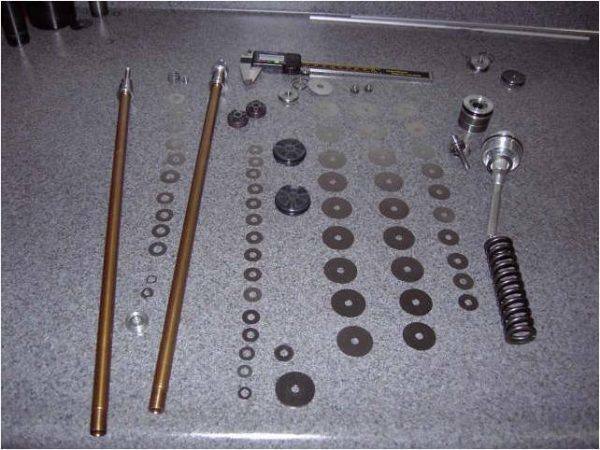 Reassembly replacing any worn parts and using high quality suspension fluids and greases. Available for all bikes including minis and KTMs. *Wear parts and fluid are not included in the price. 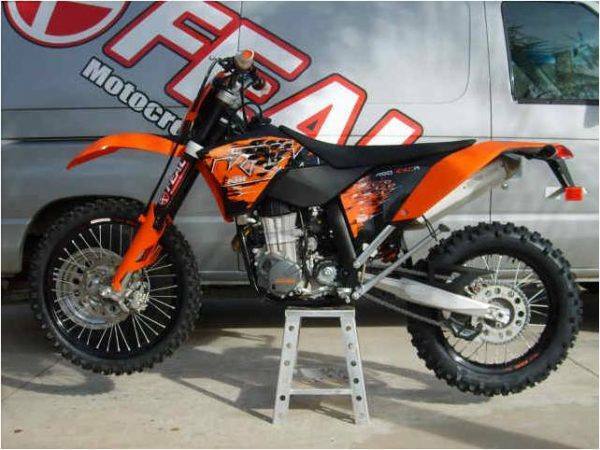 Picture Below: KXF250 Pro Privateer Kit (red/black color option). 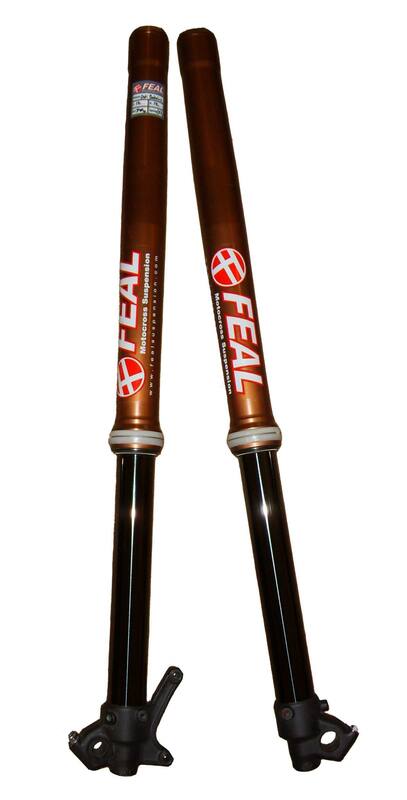 For riders that demand a lower stance we offer lowering of the shock and forks. We strongly recommend revalving suspension when lowering in order to account for geometry changes. We successfully lower bikes enabling riders to gain confidence and comfort while riding. *Price does not include wear parts if needed or suspension fluid. 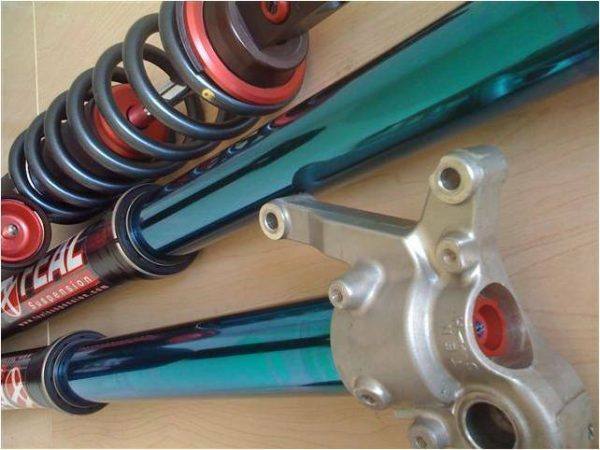 We carry most OEM suspension wear parts as well as springs. Call for wear part prices. We can get custom spring rates that are uncommon. Just tell us what the rider weight is and we can get a spring custom made just for you. 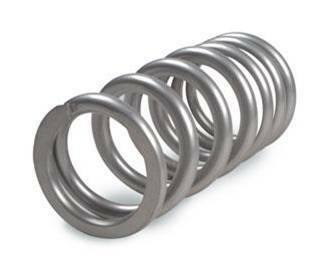 Variable rate springs are also available. Custom made springs take about 2-3 weeks to make. Feal Suspension maintains and tunes street bike suspension. 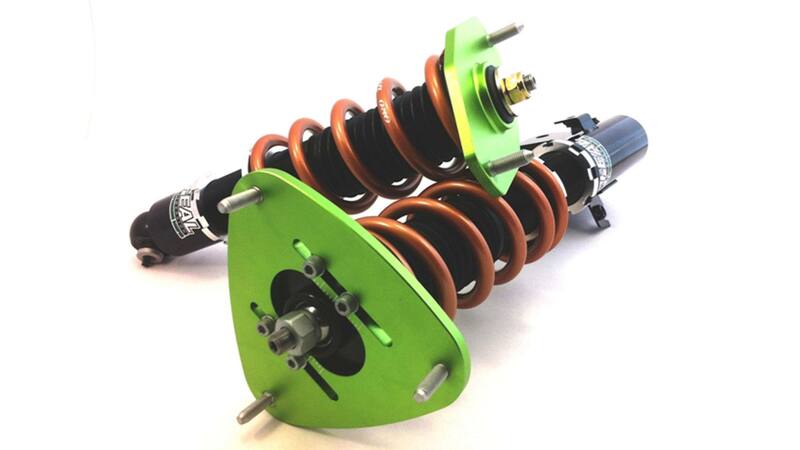 We offer the same suspension services for your mini 4 stroke as we do for full size race bikes. We have done testing with various popular aftermarket suspension systems including; Marzocchi, Elka, Race Tech, Pitster, and KX models damping rod forks. 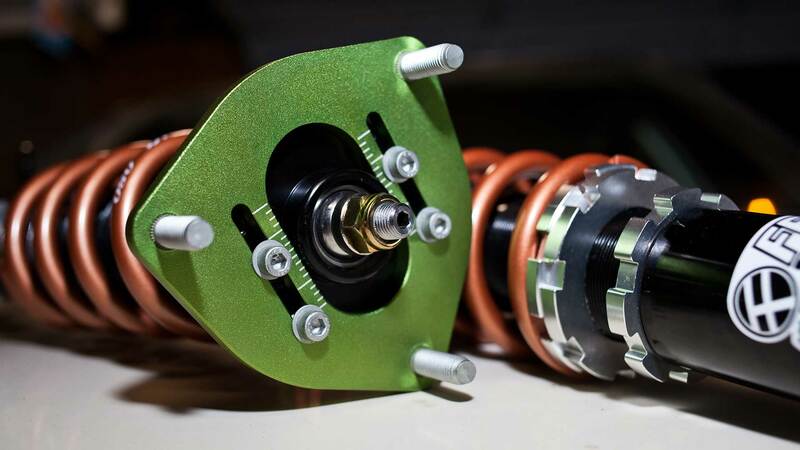 We have found that these suspension systems can yield great performance when properly tuned to the riders weight, height, riding ability, and terrain commonly ridden. 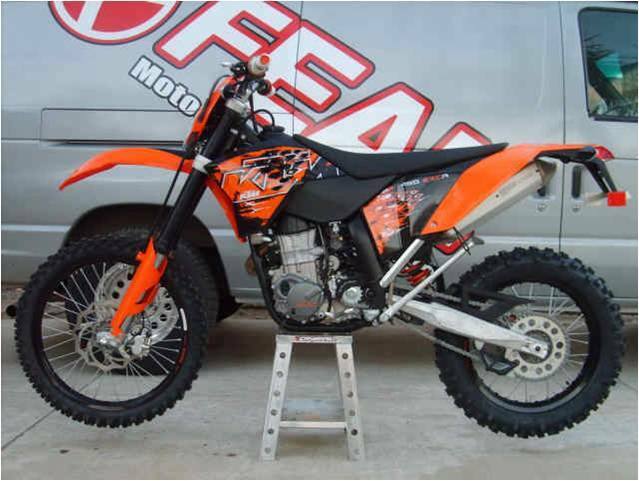 We take pride in making your mini 4 stroke's suspension perform as well as a tuned full size race bike's. 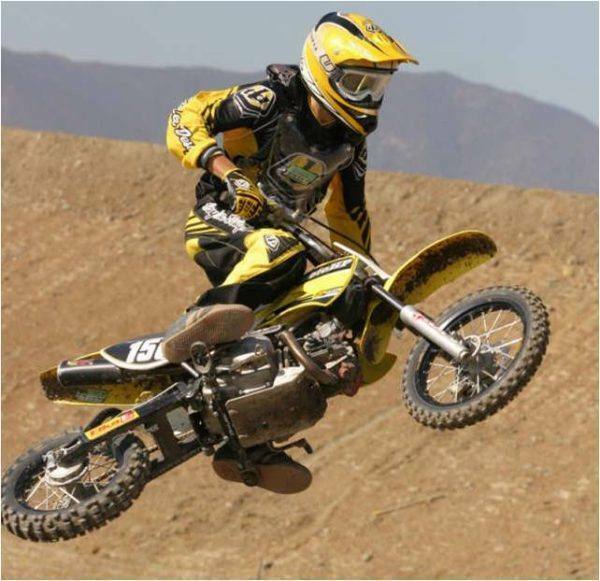 "As seen on the podium of almost every racing class in every Mini race such as Mini Moto SX, Las Vegas"
In addition to shock services, we stock many wear parts and in most cases have higher performance wear parts such as seals, bump stops, and bushings. After we perform a revalve we pre-set your external adjustments as well. If you wish to exlpore different external settings on your suspension, the charts below will be handy. Too soft all the way through the travel Turn Compression adjuster clockwise in increments of 3 clicks until ride feels better. 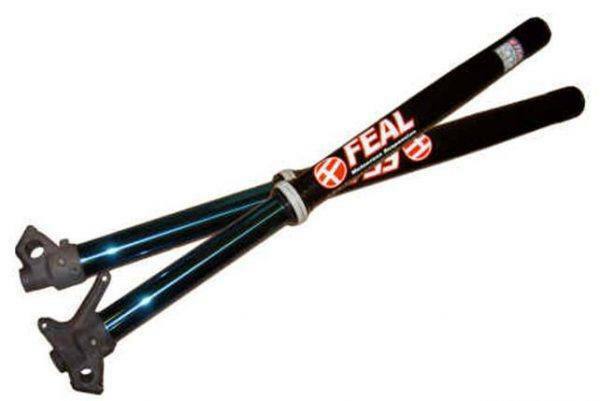 feels better OR raise front end by moving forks in clamps within factory range. Dives but feels harsh Turn Compression adjuster clockwise in increments of 3 clicks until ride feels better. Feels loose Turn Compression adjuster clockwise in increments of 3 clicks until ride feels better. Bike does not recover fast enough after cornering Turn Rebound adjuster counter clockwise in increments of 2 clicks until ride feels better. Dives too much Turn Compression adjuster clockwise in increments of 3 clicks until ride feels better. Too harsh all the way through the travel Turn Compression adjuster counter clockwise in increments of 3 clicks until ride feels better. 2 clicks until ride feels better. of 2 clicks until ride feels better. in increments of 1 turn until ride feels better. of 3 clicks until ride feels better. in increments of 3 clicks until ride feels better. Measure distance from a point on the rear wheel axle to a point directly above (rear fender) when the bike is on the stand. With the rider sitting center position on the seat, measure distance between the same points. Subtract these two measurements from each other and you have your race sag. Then with the bike standing on its own measure distance between the same points. 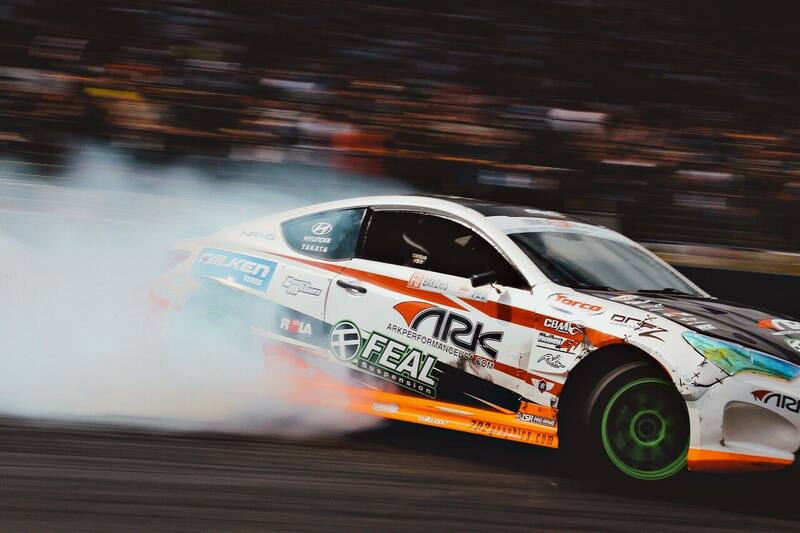 You may want to push down on the rear to settle the suspension al let it come back on its own. Subtract these two measurements from each other and you have static sag. In some cases you may have the correct shock spring based on your riding criteria but will not be able to set proper race sag without keeping static sag in the 250mm range. In this case you should compromise race sag to get close to the proper static sag measure of 250mm. Feel free to call us at (909) 930-1300 for any additional questions.